"Wind All Day" from the Shijing or Book of Classical Poems. Issa writes that there was a strong wind blowing all day on 10/10, but the main meaning of the diary entry seems to be that he was thinking a lot about the ancient poem all day and that the clouds outside reminded him of the clouds in the poem. Below is a translation of the Chinese poem by James Legge. I've changed only one word. At the end of the last line in the third stanza, Legge (along with several other translators) has "gasp," but the text says "sneeze" (Windows won't produce the character!). Probably "sneeze" seemed out of place to many translators, but in ancient China and Japan it was believed that if one sneezed hard one's soul would temporarily leave one's body and that the sneezer might die if s/he or someone nearby didn't utter a blessing and bring the soul back. This belief was still fairly common in Issa's time. With scornful words and dissolute, -- the smile of pride. To the center of my heart I am grieved. The wind blows, with clouds of dust. [But] he neither goes nor comes. Long, long, do I think of him. Before a day elapses, it is cloudy again. I think of him, and sneeze. And the thunder keeps muttering. I think of him, and my breast is full of pain. There are various traditional interpretations of the poem, ranging from the political to the romantic. Issa's early winter hokku alludes first to the last two stanzas, in which the "I" tries to sleep but can't, because of his grief and longing. Issa stresses the allusion by using an old word for sneeze, kusame, that was originally a blessing pronounced to prevent the soul from leaving the body of someone who had sneezed. There is an underlying comic tone here, however, since Issa seems to have been woken up by the loud sound of his own sneeze. Perhaps his quilt is too thin for the season, since he finds there is already frost on the grass outside. At the same time, and more seriously, the image of the frost also refers to the first half of the Chinese poem, in which the ground is covered with dust brought by the strong wind on the day the "he" didn't come close to the "I." By overlapping frost and dust in the hokku, Issa may be implying that someone has promised to visit him but has not come, causing his sleeping mat to be colder than it should have been and making him sneeze. Is Issa's hokku also a love hokku? Soon after this hokku he even writes two classical-style waka poems, so it seems possible he is giving the Chinese poem -- and his hokku -- an obliquely romantic reading. 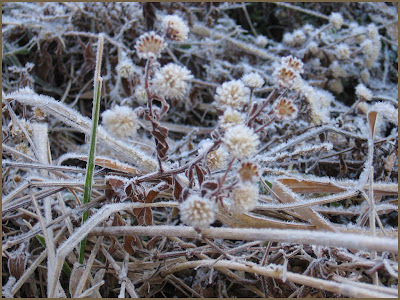 The repetition of kusa in both sneeze (kusame) and grass (kusa) is striking and synesthetically links the sound of the sneeze to the sight of frost on the grass, underlining the feeling of coldness and suggesting it isn't just a sensation but also a deep emotion.
. WKD : Frost (shimo) .